In this modern war memoir, a retired Army colonel recounts his experiences working to suppress terrorism in a strategic Iraqi city. Deane recounts his deployment to Ramadi in 2006, when it was known as the “most dangerous city in the world,” and how he and his men helped to turn it into what he calls “the safest city in Iraq” by the time U.S. troops pulled out of the country. Already a Desert Storm veteran with more than a decade of Army experience, he and the other soldiers faced numerous obstacles at the beginning of their deployment, from frequent suicide bombings to the distrust of the local leaders, whose help they needed to find al-Qaida operatives. Deane describes the slow, painstaking work of convincing local sheiks to support the new democratic government and of helping them to create an all-Iraqi city police force. He also highlights the complicated nature of securing allies across cultural barriers in a war that weaponized propaganda as much as grenades. But apart from vivid descriptions of combat and of the many casualties suffered by the U.S. troops and their Iraqi allies, the book keeps a mostly optimistic tone as it focuses on the successful joint efforts of American and local forces to make the city a safer place. It’s also illustrated with color photos of many of the people and places described. For the most part, Deane’s prose is clear, simple, and free of political soapboxing or unwarranted boasting. He acknowledges his mistakes and those of other U.S. troops while also holding to his book’s thesis, which claims that their operations had a positive impact on Ramadi and Iraq as a whole, despite their negative portrayal in the American news media. Small grammatical errors, such as the redundant “$500 bucks,” litter the narrative, and readers without military experience may get bogged down in the often untranslated Army terminology. However, the war’s historical background is well-researched, as are the back stories of many prominent players. 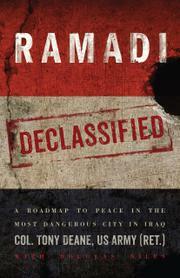 A detailed, compelling account of a little-known chapter in the Iraq War.